No taxes added to room rate. Cost is for 1 or 2 guests. Additional guest(s): + $50 per person, per night. A 100% payment is required, payable online at the bottom of this page. PLEASE CHECK OUR "AVAILABILITY" PAGE BEFORE PAYING. to confirm the date(s) for which the payment was made. Once the payment is received, we will identify the date(s) as booked on our "AVAILABILITY" page. Please Note: Our accommodation is not wheelchair accessible. ​We regret that children under the age of 16 cannot be accommodated. They say that breakfast is the most important meal of the day. At the Yellow Door, we take that to heart. Each morning we offer our guests a choice of juices, cereals, breads or toast, a hot dish of the day (pancakes, crepes, waffles, omelettes or eggs the way you like them, with bacon, or sausage), and of course selections of various coffees and teas made with our Keurig machine. We are always open to advance special requests before you arrive. Breakfast is served between 8:00 and 10:00 a.m. The Poppy Suite bedroom features a Queen bed with fine bedding and lots of pillows. Bedside tables, a bureau with 9 drawers for our long-term guests, and a walk-in closet with plenty of space for your garments that also offers extra pillows and blankets, a soft dressing gown, and complimentary disposable slippers. Your sitting room features a pull-out couch that converts to a twin bed. Your adjoining Poppy Suite private sitting room features comfortable seating, a bistro table and chairs, free Wi-Fi, a flat-screen TV with cable stations and Netflix, a refrigerator, a kettle, glasses, mugs, tea and coffee. Your full hot breakfast will be served in your sitting room, or on the deck overlooking the garden, if you prefer. The refrigerator is stocked with complimentary water, soft drinks, and if you wish, milk or cream for your coffee and tea. All the rooms are centrally heated, and enjoy central Air Conditioning in Summer. Your bright Poppy Suite private bathroom features a large walk-in shower with tiled walls and a tiled bench to relax and let the streaming water wash all your cares away. 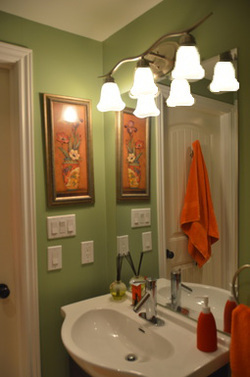 A hair dryer and a hair curler are stored in the bathroom for the use of our guests. 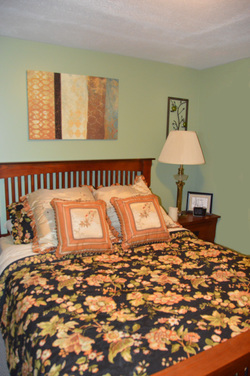 All three Poppy Suite rooms are located on the lower level of the Yellow Door Bed and Breakfast. This provides a quiet and private environment for our guests. In order to ensure that your room is waiting for you, full payment is required of the total cost of your accommodation, due upon reservation. Check in time between 3-8 p.m. or by prior arrangement. Check out time by 11:00 am. To ensure for the comfort of all our guests, the house is a non-smoking establishment. No Smoking is permitted inside the Yellow Door B and B, however, smoking is permitted on the deck. No pets are allowed, since the Yellow Door B and B has a resident yellow cat, Ginger. Please note, Ginger is NOT allowed in the guest suite. A full refund of the total accommodation cost will be provided if your reservation is cancelled more than 7 days before your scheduled arrival. ​No refunds for a "no show" or for cancellation within 7 days of your scheduled arrival, unless we are able to rebook your scheduled dates, in which case we will provide a full refund of the amount paid. ​We are proud to be ranked by TripAdvisor in the top 10% of all B&B's in Ontario . ​3- Any special requests that you may have.